The Costa Brava (Rugged or Wild Coast), stretches along the coast of Girona province from Blanes to Portbou on the border with France, and although one of the best known costas by name, is possibly the one known least about. 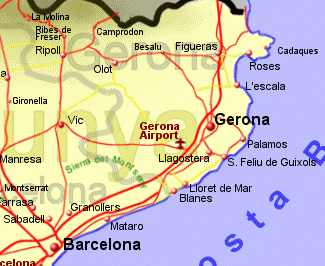 The coast from Barcelona to the Girona province border may now be refered to as the Costa del Maresme and is quite different in character but has been included here. The Costa Brava became an early favourite holiday destination in Spain due to it's sandy beaches on a rugged coastline, often with a backdrop of pine forests. Indeed this costa, possibly the prettiest of all, was a target for package holidays in the 1960's, but the many coves and fishing villages in this rugged coastline have retained their charm, particularly in the north. Blanes, on the southern end of the costa and being about 60Km from Barcelona is a well developped resort, as is Lloret de Mar, both having beautiful sandy beaches. Heading north from here, the rugged coast has many sandy coves and places of interest to stay. Further north still, about 30Km from the French border is the old fishing town of Cadaques, with it's whitewashed houses and limited beach, this is attracted people with money and artist for a long time. In-fact Salvador Dali, who was born a little way inland at Figueres, had a house near Cadaques. The Dali museum at Figueras is the second most visited museum in Spain.